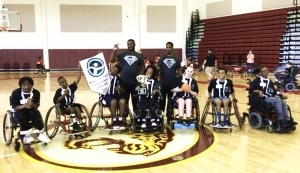 DeKalb County’s Silver Streaks junior varsity squad captured the county’s first AAASP Wheelchair Football state championship this past weekend with a 24-13 victory over the Houston Jr. Sharks at Maynard Jackson High School in Atlanta. DeKalb (7-1) jumped out with 10 first half points led by Jamal St. Rose (Stephenson High) who scored a touchdown an extra point in the half. Devin White (Druid Hills High) added a field goal and one of his two interceptions in the game during the first half. St. Rose would add another touchdown in the second half along with one by David Roberson (Stone Mountain High). White would contribute two extra points and his second interception of the game during the second half. DeKalb defeated the Muscogee Lions 35-0 in the semifinals to advance to the championship game. The Silver Streaks entered the playoffs having won five consecutive games after losing their season opener 13-7 to the Henry Hurricanes. The team would roll out wins of 20-7 over Henry (4-3), 29-14 and 42-6 over the Clayton Jr. Eagles (0-6), 23-10 over Houston (5-3) and 1-0 over Muscogee (2-5) to finish the regular season 5-1. DeKalb’s team is coached by Delton Shoates (Chapel Hill Elementary) and Everette Shoates (Coralwood Diagnostic Center) and assisted by Area Coordinator Lisa Patterson (Druid Hills Middle). The championship game squad members include Najee Smothers (Laurel Ridge Elementary), Devin White (Druid Hills High), Keith Debrosse (Decatur High), Imani Ingram (Tucker High), Gary Whyte (Cedar Grove), David Roberson (Stone Mountain) and Jamal St. Rose (Stephenson). 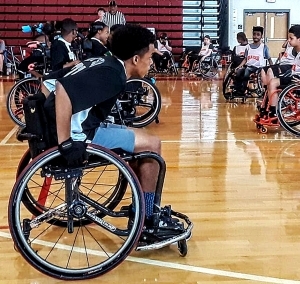 The state title is the sixth for the DeKalb Adapted Sports programs including varsity wheelchair basketball (1997) and varsity soccer (1996) by the DeKalb Red Hot Rollers, the 2006 and 2009 JV basketball title by the DeKalb Eagles and the 2015 JV basketball title by the Silver Streaks.